When I started the low FODMAP program, it felt impossible to stick to such a small pool of foods for the rest of my life. How was I supposed to navigate work events or weddings or coffee dates if I couldn’t eat anything? The truth is, I had fallen prey to 3 common myths about the Low FODMAP Diet. Check out the article below for some myth-busting facts about the low FODMAP program. Hopefully, this information will help you start your journey off on the right track and with the right expectations. Even though the low FODMAP program does, in fact, use the word “diet,” it’s a tool to find IBS triggers; not a weight loss program. The low FODMAP program is confusing, stressful, and time-consuming, so your focus should be on eliminating high FODMAP foods from your diet. Also, because the elimination phase is so limited, cutting out foods like pasta or bread will make the diet more challenging than it needs to be. If weight loss is something you’re interested in, let your dietitian know. They can help you transition from the Low FODMAP Diet to a long-term lifestyle designed with your weight loss goals and your personal sensitivities in mind. This way, when you’re ready to move to a healthier lifestyle, you’ll know which foods are safe for you and which you should avoid long-term. This will give you a wider range of food to eat, and give you confidence when managing your IBS and your food choices. The Low FODMAP Diet can be a helpful tool for managing IBS symptoms. But, your doctor or dietitian may not have mentioned that the Low FODMAP Diet is “successful” if your symptoms are reduced by at least 50%. This means you might have some lingering issues, even if the program worked for you. General Gut Irritants – This should be your first stop when trying to manage digestive issues, as they cause problems for so many people (whether they have IBS or not). Common gut irritants include caffeine, alcohol, greasy or spicy foods, chocolate, etc. Even though these foods are not high FODMAP, your body may react to them in a similar way. Other gut irritants include gums. These include guar gum and xanthan gum (as well as some others). While they are not FODMAPs, they cause soft stool by pulling extra water into the intestines. This acts as a laxative. Chris Kresser has an awesome article on xanthan gum. You can read it here. Portion Control – Some people are triggered no matter what they eat. Sometimes it’s not the food itself, but rather how much you eat. Too much food in the digestive system at once can stress out your bowel. This might cause symptoms like bloating, cramping, or diarrhea. If you have symptoms after eating a low FODMAP meal, first, try eating a smaller portion. If this leaves you hungry, try splitting a larger meal into two servings and eating them a few hours apart. Sleep – Think about how stressed you are when you’re short on sleep. Your nervous system feels the same way. Except it yells at your intestines instead of the dog. Aside from helping with your brain-gut connection, getting enough sleep can also help you make better food choices, get up and exercise, and cope with stressful situations. All of these will help manage your IBS symptoms. Moving – Finding ways to move throughout the day can reduce stress and help encourage healthy movement in the bowels. For example, there are several forms of yoga that won’t stress out your digestive system and can help relieve trapped gas and constipation if you’re in pain. Stress – Stress and anxiety can cause flare-ups no matter what you eat. It can be helpful to have some stress management tricks in your IBS toolbox. Some ideas include finding better ways to manage your time, cutting down responsibilities (through delegation or saying “no”), removing toxic relationships, taking the time to decompress, or asking for help when you have too much on your physical, mental, or emotional plate. When I started the Low FODMAP Diet, I thought I was supposed to stay in the elimination phase forever. Spoiler alert! The elimination phase is actually the first of three phases and it’s only followed for 2-6 weeks. If you follow the program the way it was designed, you should end up with a long-term diet tailored to your needs. This long-term plan should include the maximum number of foods you can tolerate, even if you can only have some foods as a treat, or in small portions. 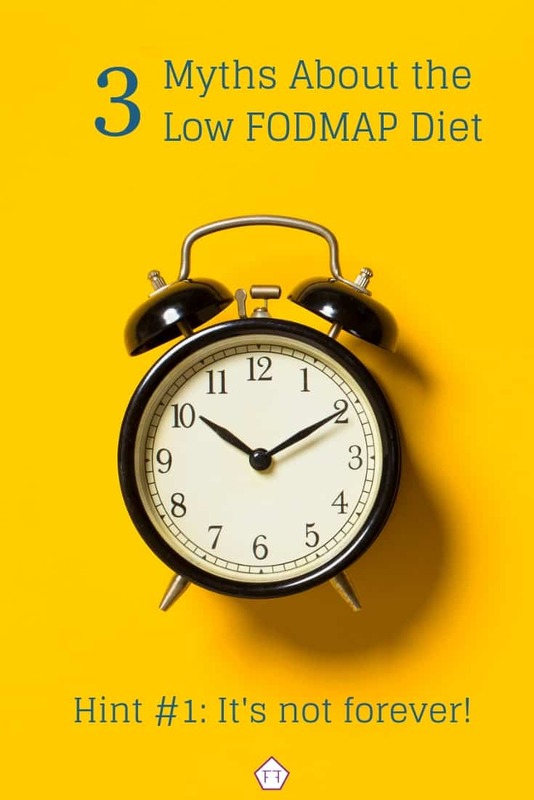 You can learn more about each phase of the Low FODMAP Diet here! That was a lot of information! Hopefully, these myth-busting facts will help you get your low FODMAP program off to a great start. If you want to keep this article for later, you can PIN IT for later. Don’t forget to sign up for my mailing list below. You’ll get new articles and low FODMAP recipes delivered right to your inbox. You can also follow me on Facebook for more articles on IBS and the low FODMAP program. Together we’ll get the Low FODMAP Diet down to a science!